The Story: Boris and his class are getting ready to do a show. After a few problems Miss Cluck finds Boris a job that he can do to help with the preparations and a rummage through the dressing up box provides the perfect costume for a large bear. However, disaster strikes when the tractor carrying the audience gets stuck in the mud, it is down to Boris to come to the rescue so that the show can go on! 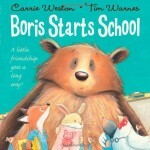 We have read Boris repeatedly since I won this book in a competition on Tim Warnes’ website and he has become a firm favourite of ours. Boris is such an adorable character who is trying hard to fit in and be part of the class despite his size. The familiar setting of a school and the cute animal characters are very easy for children to identify with and I find the text easy to read with a lovely font, there are also extra quotes from the characters within the pictures. We love Tim Warnes’ beautiful illustrations (being a teacher I particularly love the very realistic displays on the wall of the classroom!). My daughter also has her favourite pictures (Maxwell’s pink wig and the old fashioned telephone have her in fits of giggles!). The gentle pace of the story makes it a good bedtime read. We definitely look forward to reading more about Boris and his friends. Thanks for reviewing my book, Catherine. I spend a lot of time in my local schools, one way or another, which is why the classroom setting looks so believable. I love the chaotic mess and little posters and displays, which have all been inspired from real life. Glad you like the extra asides from the animals – that was my idea! Thanks for visiting Story Snug Tim. This book is also lovely for me as a parent to read and we are still finding new things in the illustrations, the extra comments are a great idea. We have just noticed the mouse dressing up as Miss Cluck! It’s the little details that make repeated reading a pleasure. We’re looking forward to seeing Boris with spots! 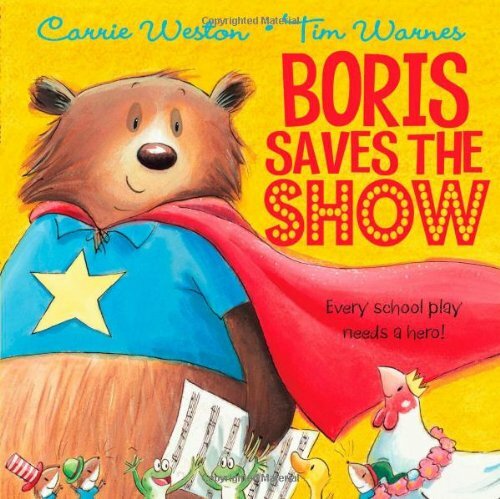 I have just come across the site and the review of Boris Saves the Show – I am so glad he is loved and enjoyed! Thank you for writing about such a lovely bear. We received the book at the same time that we were practising for our own Christmas show so we knew exactly how Boris was feeling when things didn’t go quite right!